WASHINGTON, DC and NEW YORK (September 14, 2017)–If Congress fails to renew a critical fund for community health centers, which is due to expire at the end of the current federal fiscal year on September 30, these safety net providers stand to lose 70 percent of their federal grant funding by 2018. As a result, an estimated 9 million people could lose access to health care, according to a new infographic produced by researchers at the Geiger Gibson/RCHN Community Health Foundation Research Collaborative at the George Washington University's Milken Institute School of Public Health (Milken Institute SPH). 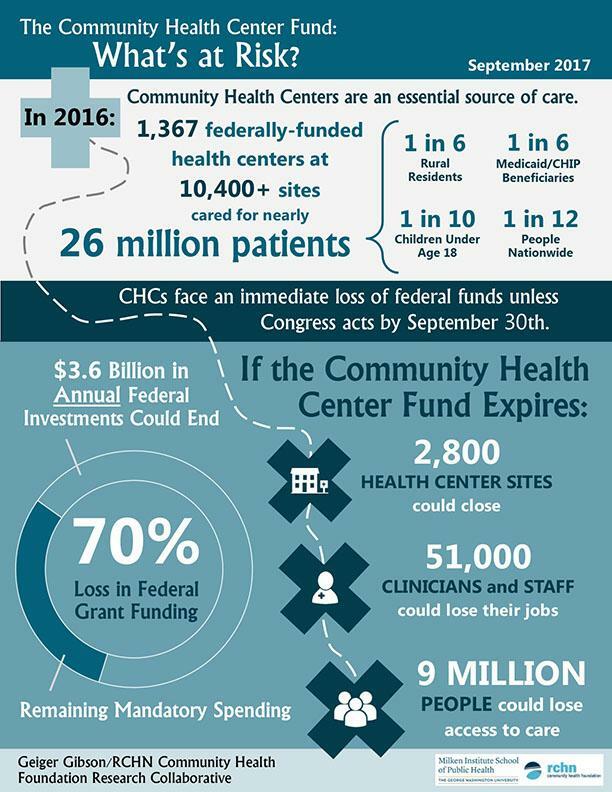 The infographic depicts what is at stake for medically underserved communities nationally if the Community Health Center Fund is not renewed. This crucial federal fund supports the nation's 1,367 community health centers, which served nearly 26 million people at more than 10,400 sites in 2016. Like the Children's Health Insurance Program, which is also set to expire at the end of this month, the health center program enjoys broad bipartisan support. The infographic, "The Community Health Center Fund: What's at Risk?" is freely available at the Milken Institute School of Public Health's website. For more information or to interview Sara Rosenbaum, JD, the Harold and Jane Hirsh Professor of Health Law and Policy at Milken Institute SPH, please contact Kathy Fackelmann at [email protected] or 202-994-8354. The RCHN Community Health Foundation is the only foundation in the U.S. dedicated solely to community health centers. The Foundation's gift to the Geiger Gibson program supports health center research and scholarship. The Milken Institute School of Public Health at the George Washington University is the only school of public health in the nation's capital.